Super easy Paleo recipe. Full of flavor and volume in under a half hour easily! Remove your Instant Pot lid and set aside. Press the sauté button, and then the adjust button to set it to high heat. Add your olive oil and wait for the oil to crackle in short time. Add your diced potatoes and onions, stir them around the pot for a minute or so using your flat edged spoon to scrape anything sticking to the pot. Cook for a few minutes until the potatoes and onions appear to have softened a bit. You do not want to fully cook your potatoes! We are just getting some flavors to come out of them with the onions. Press the cancel button to turn off your Instant Pot from sauté mode. Carefully add your sauerkraut and water, and stir well. Layer your slices of kielbasa along the top of the kraut and potatoes. Cook on the Steam setting for 5 minutes. You can quick release and eat, or wait up to 10 minutes on keep warm mode. Staying in the pot in the keep warm mode for too long can result in mushy potatoes. 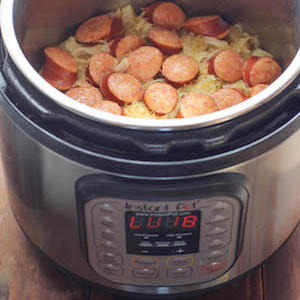 I love this meal, having been making my other kielbasa and kraut recipe in the slow cooker for years. Pairs nicely with a spicy brown mustard.